Caramel, my warm and sometimes temperamental cold-weather-companion, has returned. And the reunion didn't require too much persuasion. A cool night, the slight chill carried on a breeze and the need to pull out my beloved grey cardigan. These were all the neatly lined-up factors which led to a craving for the rich buttery sauce. It's a bittersweet time of year. I love autumn, but that love is tainted with the dark spot on the horizon known as Winter. And I never want to let go of summer. If summer were a person I would be clinging to it's legs, using all my strength to keep it from walking away. This recipe reminds me of a naked candy bar. Please tell me that I'm not the only one who has eaten a Snickers bar in segments. Maybe because I was only allowed to have candy on Halloween, I learned how to savor each and every morsel. I would carefully bite the thin chocolate layer off the top of a Snickers (my least favourite part because it wasn't dark chocolate.) The caramel, nuts, and soft nugget were my targets. I loved the mix of salty, sweet, chewy, soft, and crunchy! 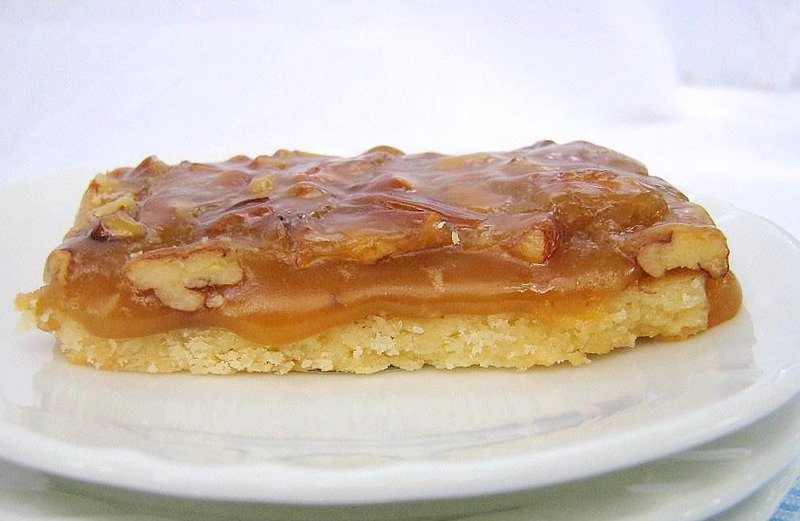 These shortbread bars are the grown-up versions of the 'naked' Snickers. 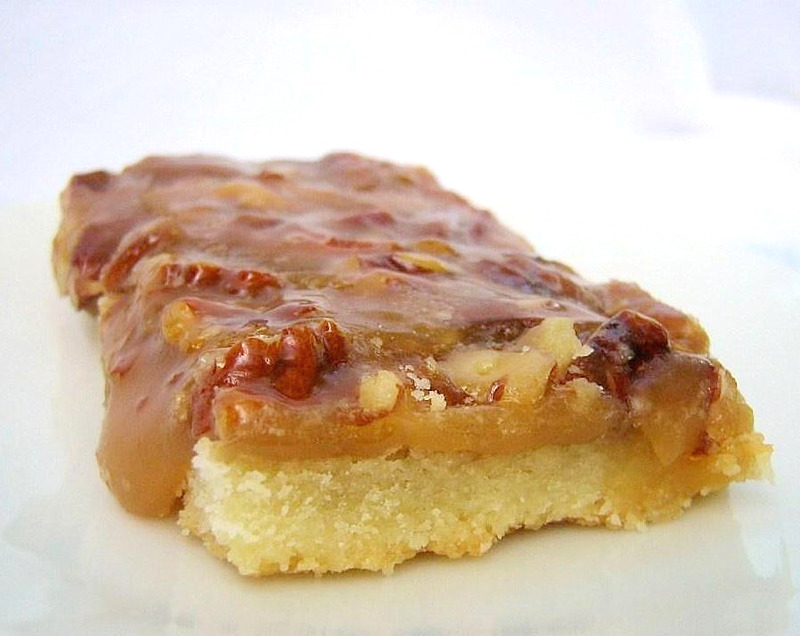 A not-too-sweet buttery shortbread, creamy salted caramel, and crunchy toasted pecans. There is a heart-stopping 3 sticks of butter in the recipe so please be sure to share the gooey goodness with a lot of people and have plenty of napkins on hand, these are too fun to eat with a fork. Toast the pecans: Preheat the oven to 350 F. Scatter the pecan halves onto a cookie sheet and bake for 5-8 minutes or until they just begin to get aromatic. Keep a close watch on them because they can burn very fast once they become fragrant. In a food processor, pulse the flour with the sugar and salt. Add the cubed butter and process until the mixture resembles coarse meal. Sprinkle on the ice water and vinegar and process until the crumbs are evenly moistened. Turn the crumbs out onto a sheet of wax paper and knead just until the dough comes together. Pat the dough into a disk, wrap in plastic and refrigerate until slightly chilled, about 15 minutes. Line the dough with parchment paper and fill with pie weights or dried beans. Bake for about 25 minutes, until the dough is just set. Remove the parchment paper and weights and bake the crust for about 12 minutes longer, until lightly golden and set. Let cool. In a large saucepan, combine the butter, brown sugar, honey and salt and cook over moderate heat, stirring, until foamy and slightly thickened, about 10 minutes. Add the cream and cook, stirring occasionally, until a candy thermometer inserted in the caramel registers 240° (soft ball stage), about 10 minutes longer. Add the pecans and cook for 2 minutes longer. Pour the filling over the crust, spreading it evenly. Bake for about 15 minutes, until the crust is golden and the topping is bubbling. Let cool completely. Slide the parchment onto a cutting board. Cut into bars and serve. This caramel shortbread does look like a naked candy, and that's just delicious. Where's the hot tea though (smile)? this looks so good, i dont want to have to wait and bake a batch allready!!! It's good to know that I'm not the only one who takes their time with the Snickers! Dear! wish Ihad one right now, looks divine and just lovely. I like the look of your blog! You had me at "grey cashmere cardigan". I love summer, but there are many reasons to love the fall, too. I can't think of a better way to usher it in. Oh, my, this looks good! Yummm...a tasty way to welcome the new season! Valerie you are really nasty showing naked temptation !!! I'm sure I'd love it but have to resist !! Oh my. That caramel oozing down the sides is making my mouth water, Valerie. Salt just sets off so many sweet things, doesn't it? I love salted caramel. Hey Valerie, you think I have photography skills? Score (smile)! Yummy! 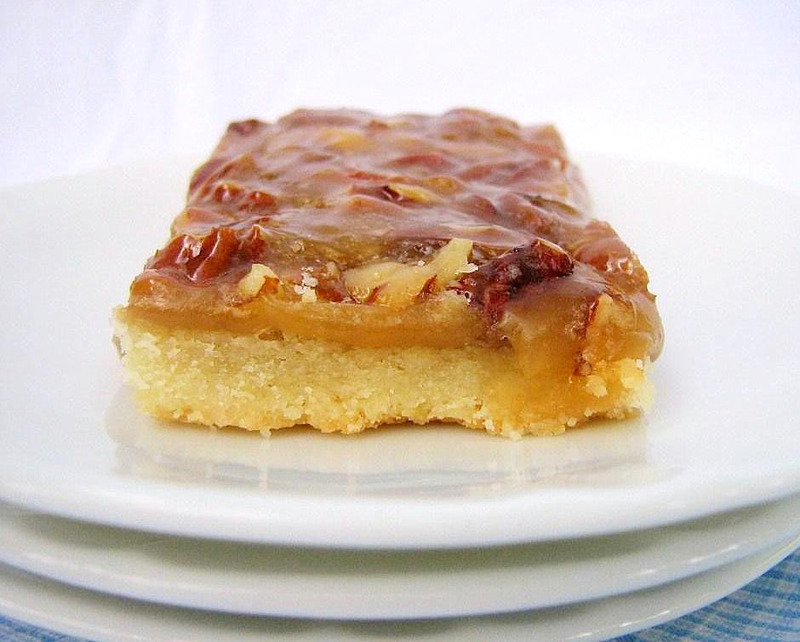 Peacan and caramel make such wonderful topping..
Pecan and caramel make such a delicious topping! Yummy! I love these deconstructed candy recipes, I recently just made one too. It looks wonderful! That's awesome, Kim! I'm so glad that i'm not the only one with milk chocolate issues...as well as eating Snickers bars as though they're mini-meals.